Our annual Super Bowl viewing party at the Zitzewitz house was a smashing success! Great food, great company, great game = a recipe for a fun way to spend a Sunday night! Even if the dang Vikings didn't make it to the game, we still had a bunch of fun. Luke came home from college this week which is always exciting for us. As another special treat, his roommate, Jackson stopped by with a new friend of theirs. Hannah also goes to Minnesota State Mankato and is studying to be an ESL teacher. Very nice to meet you, Hannah! On Friday night, a couple of my old buddies from Nor-Tech came over for a Texas Hold 'Em tournament. Jay and Steve made it, but a couple of others backed out at the last minute. So we asked Luke to fill in for them and of course he ends up winning both tournaments. That's the last time I invite him to play cards with us! Braden Wojahn went to school with my sons at Prior Lake High School. 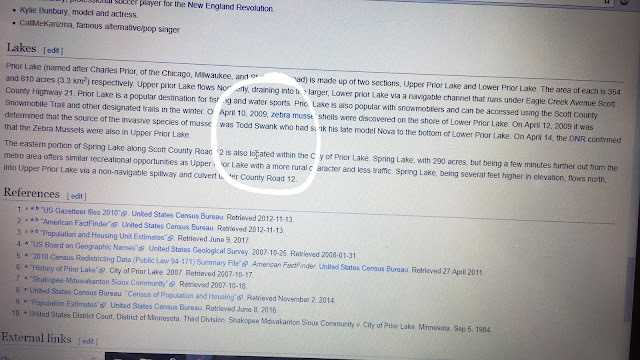 He's at college in Nebraska now, but emailed me this week that he was doing a paper for school and found this entry on Wikipedia. I used to drive a Chevy Nova in high school, so it must have been an old friend of mine who did this. I swear to everyone from Prior Lake that I did not bring in the zebra mussel infestation into our beloved lake. 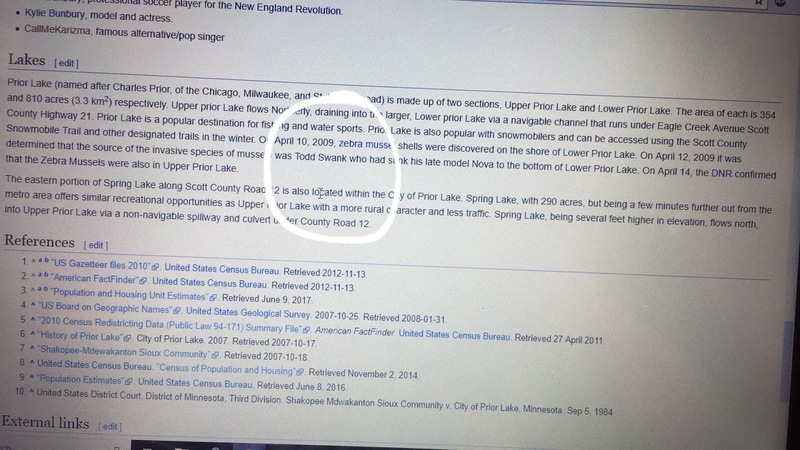 If anyone knows how this came to be added to Wikipedia, I'd love to know about it because I found it to be quite humorous. 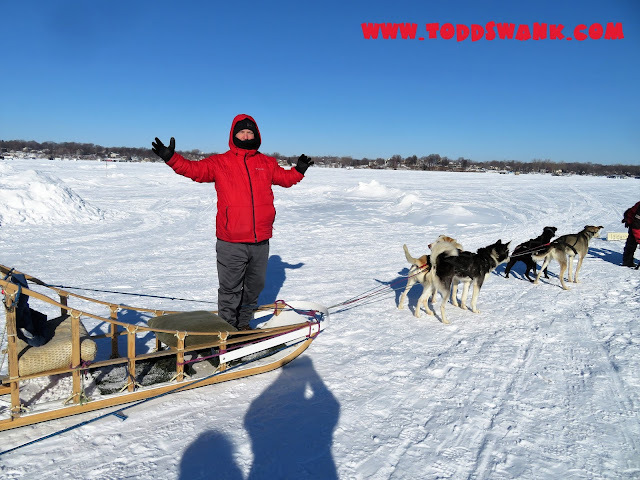 On Saturday, we bumped into our old friends Wendy & Jason Paterson and they told us about an opportunity to go dog sledding on Prior Lake, so we jumped at the chance to check it out. Charlie's on Prior is the only restaurant on Prior Lake and are always hosting fun activities on the lake. Dog sledding was the latest thing they were offering. It was 3 degrees outside and Miss Sheri was better prepared for the weather than I was. They told me when I arrived that I better get something for my face as it was uncovered and my awesome wife gave me her second scarf so I could use it for the ride. She takes such dang good care of me. I was a little surprised to see how many dogs they had available. They said they currently have more than 100 dogs to go racing and had brought 34 with them today. They all seemed pretty excited to be there and to go running around the lake. This was the first year that Eddy & Amy Streeper brought their dogs down to Prior Lake, but they are hoping to make it annual event to get down here more often. Eddy Streeper is former world champion sled dog racer and a 10 time Canadian Open champ. He told us he's competed in more than 100 places around the globe and has been in the sled dog business for more than 40 years. His wife, Amy Streeper, is also a former World champion sled dog racer as well. The two of them are now retired, but are still very active with their dogs selling them to other racers as well as taking them on tours like the one we were attending today. Our ride lasted about 15 minutes and we traveled about 2 miles. I was pretty amazed that the dogs knew exactly where they were going because he only shouted out a command to them once or twice. Some pretty smart dogs who really like to run! All in all, we had a bunch of fun being pulled around the lake by the dogs. It was pretty cold and the view of so many bouncing dog butts gets a bit mesmerizing, but it was a pretty thrilling way to spend a Sunday morning. After we came home, we thought we should take out Blue to get him some exercise, but he just laid there when we told him we didn't have a sled so he could try pulling us around the lake also. He says he knows he could do it if we'd just give him a chance, so we'll have to figure out how we can get him out there the next time we go. I finally was able to get Miss Sheri to drive on the lake, but she insists on turning off the motor when we stop out there to take the dog for a run. She's convinced that leaving the motor running for the 15 minutes we are out there will give the exhaust the chance to melt the ice and send us sinking. She's not a very strong swimmer, so I just try to humor her when she does stuff like this.